In Italian, boccone dolce means "sweet mouthful." When I worked at Genoa, a wonderful little Italian restaurant in Portland, the pastry chefs made beautiful bocconi dolci: plate-size meringues layered with fresh berries, whipped cream, and shaved chocolate. Here's my slacker version, which uses store-bought meringue cookies instead of homemade meringues. Fashion this any way you like — on a plate, layered in a glass — so long as you serve it as soon as you make it, otherwise those little meringues will start to melt. Make the chocolate sauce: Place the chopped chocolate, water, and cream in a heavy saucepan. Over low heat, melt the chocolate, stirring often. Once the chocolate has melted, turn off the heat and whisk in the butter, Grand Marnier, and vanilla. Pour sauce into a pitcher and allow to cool to room temperature. Prep the bocconi dolci: Place half of the berries in a medium-sized shallow bowl and crush them with the back of a big spoon (if using strawberries, slice all of them into a bowl). If the berries are not particularly sweet, sprinkle them with sugar. Whip the cream into soft peaks; sweeten with a spoonful of sugar as you're whipping the cream. Place the meringue cookies on a clean counter and gently — you still want chunks of meringue, not pulverized bits — crush them with a rolling pin. 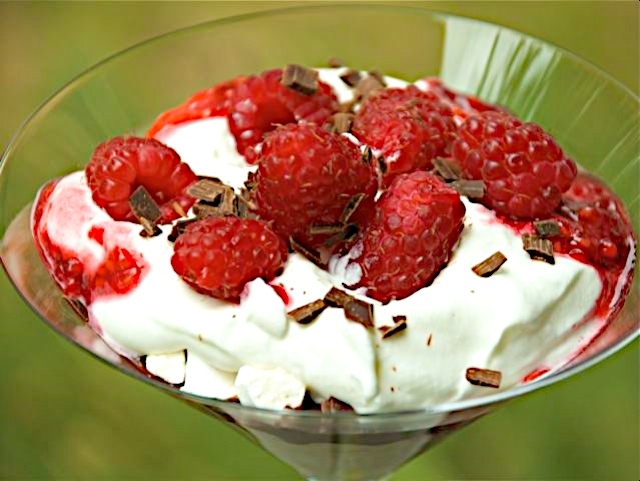 Assemble the bocconi dolci: Spoon a large spoonful of whipped cream onto a plate or into a pretty glass. Top with ½ cup crushed meringue. Top meringue bits with a large spoonful of the crushed berries and a small handful of the whole berries. Drizzle chocolate sauce over the berries. Add a dollop of whipped cream, a few whole fresh berries, and a sprinkling of the shaved chocolate. Leftover chocolate sauce can be reserved for serving with ice cream or pound cake (or eating plain, by the spoonful). You can, of course, use store-bought chocolate sauce if you don't feel like making your own sauce.